At Panasonic Centre near from lively Odaiba with summer vacation season, Digital Art Festival (DAF) Tokyo presented by a TV programme on NHK BS “Digital Stadium” was held. I didn’t have a clear image of what is called as “digital art”, much less “media art”. They are interactive art, movie, web, etc…, simply to say, it’s just “a work which is created using computer technology” and the way of expression is varied and friendly. It’s not complex things at all and it’s not a thing which only exist on a screen. What the most interesting thing was “Gadgets” coloured with various ideas. 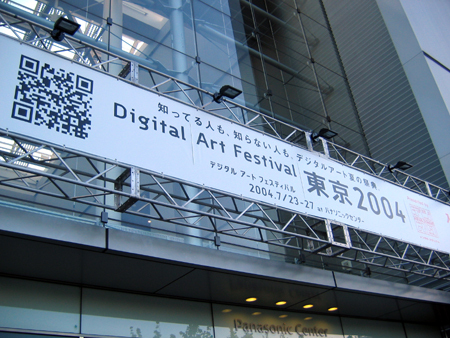 “Tokyo Gadget Exhibition” was a part of DAF Tokyo. Gadget means “a small device or machine with a particular purpose” but the works exhibited were sometimes difficult to find out how to use/play with it. However, once you have the courage to touch them, you would be unexpectedly impressed. (too much exaggerated?) But I think it’s a charm of “Toy”. They are interesting because they are not just a “thing” but also they have a kind of world or idea which appears by touching them. Gadgets which were introduced in the exhibition attracts people not imitating some animation characters, sometimes having high technology on board which is unexpected from its pop design appearance and idea which give us small happiness. Now let’s introduce some gadgets. They are an emerging creative unit of Alexandre Armand and Bram Dauw, who are students at ECAL (Ecole cantonale d’art de Lausanne). The next one is “Ship of Zipper” by Yasuhiro Suzuki. This idea come from the view from a ship that waves behind the ship looks like a zipper. Only the video was shown at the venue but I felt like seeing it from a full-size ship. This (see above) is “Canned Sound” which looks like just a can at a first glance. Once you put your voice or any sounds in the can and put the lid on it, these sounds are kept into a can until when somebody open the lid. You can listen the sounds echoing repeatedly when you hold the can to your ear. “Dompika -dividing flame-” is a heartwarming work which divides flame lit by a reaction to a sound . It was created with the idea that sounds of fireworks burn flame. It was sold very well in school festival. This work won “Takara Award” with being commercialized in view. We might see people with “Dompika” in their hand and pass the flame each other at fireworks festival in the near future. The last works is “Ototenji (sound-braille)” by Mika Fukumori. It is a device that allows people who can see to easily learn braille using their eyesight, hearing and touch. Japanese Braille is expressed by 50 letters with a combination of 1 grid with 6 dots. The combination of vowels and consonants determines the sequence of the grids. Blocks are inserted into a panel with 6 holes and when the figure is in the braille sequence, the sound of the corresponding letter is played from the speaker. Each vowels is differentiated with colour of lights. It enables people to learn braille playing with it. It’s impossible to introduce all works here. I’m also wondering if the feeling which I got from touching the works can be reported with only texts and images to you. If there is any opportunity to see such gadgets, I strongly recommend you to play with it, not just looking on them at a distance! * On the last day of this festival, the winner of Tokyo Prize, which is selected by voting from visitors, was awarded. It is on the web site now.